The Berkuts (English: Golden eagles) are a Soviet and later Russian aerobatic performance demonstrator team connected with the Russian Air Force. The Berkuti were founded as a helicopter aerobatic team in 1992 and used first four, later six, Mil Mi-24 of different versions. The helicopters were painted in the usual camouflage colors, however, had at the height of the cockpit starting a lightning-shaped strip of over the whole length of the hull in the Russian national colors (White, Blue, Red). And on the righthand side in area of the cockpit the team emblem. The Berkuti changed to six Mil Mi-28N combat helicopter. On August 2, 2015 at the end of the flight demonstration at Ryazan a helicopter of the Berkuti teams crashed down and caught fire. A pilot could bring itself in Security, the other pilot was killed. The reason for failurewas seen in the hydraulic system and lead to a temporarily grounding of the whole Mi-28 fleet. However, already at the MAKS Airshow end of August 2015, the team showed again it's air display show. 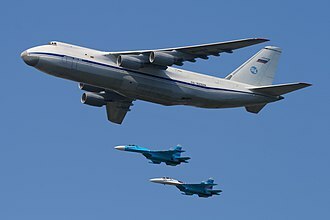 The three teams Berkuti, Russian Knights/Russkiye Vityazi and Swifts/Strizhi belong to the standard teams at the MAKS (air show) and the victory parades in Moscow. 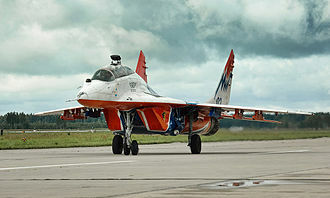 ^ "Russian Berkuti helicopter aerobatic team is celebrating its 20th anniversary - News - Russian Aviation - RUAVIATION.COM". 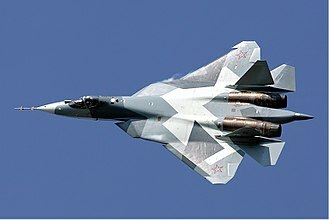 ruaviation.com. Retrieved 2015-10-12. 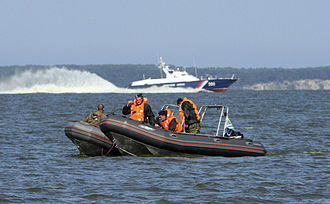 ^ "Failure of hydraulic system caused Mi-28N crash near Ryazan | Russia Beyond The Headlines". rbth.co.uk. Retrieved 2015-10-12. Wikimedia Commons has media related to Berkuty Flight. 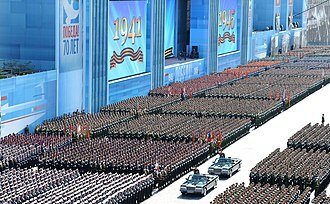 The 2015 Moscow Victory Day Parade was a parade that took place in Red Square in Moscow on 9 May 2015 to commemorate the 70th anniversary of the capitulation of Nazi Germany in 1945. Being a landmark jubilee parade honoring the 70th anniversary of the Allied victory in the European continent, col. Gen. Oleg Salyukov, the Commander-in-Chief of the Russian Ground Forces, was the 2015 commander. Following the official parade, over 500,000 Russians and foreign attendees marched through central Moscow in commemoration of those who perished and it is estimated that up to 12 million Russians participated nationwide in the 2015 March of the Immortal Regiment. In all, around 30 international leaders attended the parade, including heads of UNESCO, the UK was represented by the grandson of World War II leader British Prime Minister Winston Churchill, Nicholas Soames. 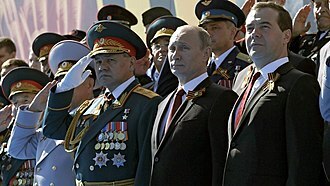 A number of World War II veterans from the US and UK were present at the victory day celebrations as private attendees. Three days after the Victory Day parade, US secretary of state John Kerry laid a wreath at the Tomb of the Unknown Soldier in Sochi with Russian foreign minister Sergey Lavrov. Also, several vehicles that drove through the Red Square in the 1945 Victory Parade are being readied for their drivepast in other major Russian cities. Some of the big parades featured an air fly past for the first time, beginning in November/December 2014, preparations for the parade were well attended at the unit level. Individual unit practices were held in the military installations for all the participating units, and by March 2015. 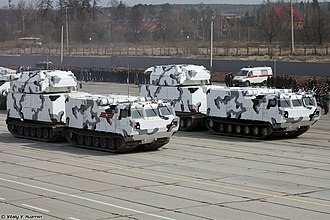 Before the first parade dry run, there was the first practice drivepast of the estimated 200 mobile column vehicles in attendance this year, the first parade practice run on 3 April 2015 kicked off officially the preparation for the big parade, despite the snowy weather that day. This was followed by the first test run of the flypast column in the Alabino training grounds on 9 April, with the more than 150 aircraft taking part in that first run-through of the flypast segment. The unit marching for this comes from the ranks of the Kuban Cossacks. The 2nd dry run for the flypast was done on 21 April, Gen. 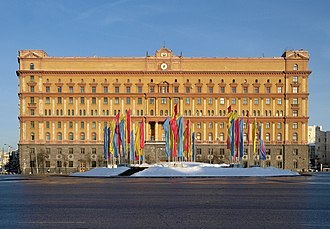 The Moscow Victory Day Parade of 2010 was held on 9 May 2010 to commemorate the 65th anniversary of the capitulation of Nazi Germany in 1945. The parade marks the Soviet Unions victory in the Great Patriotic War, taking part for the first time were the Yakovlev Yak-130 jet trainer aircraft and the Mil Mi-26 heavy helicopter. The mobile ICBM Topol-M missile, that first appeared at the 2009 parade, was here again for the second consecutive year. The 2010 Parade marked the first time that foreign and Commonwealth of Independent States soldiers joined Russian forces on Red Square for the parade, battalions from the CIS included Armenia, Belarus, Kyrgyzstan, Moldova and Ukraine among them. Upon request from the government of Turkmenistan, the contingent from Turkmenistan was led by an officer riding on horseback, Poland was represented by the Representative Battalion of the Polish Armed Forces. The United States was represented by the 2nd Battalion of the 18th Infantry Regiment, France was represented by pilots and aircraft from the Normandie-Niemen Air Regiment. Russian President Dmitry Medvedev called the inclusion of troops in the parade recognition of their common victory in World War II. The inclusion of troops in the parade was not without controversy. The Communist Party of the Russian Federation held a May Day rally in Moscow, a poll run by the Levada Center saw 20 percent of respondents disapproving of the presence of foreign troops, with 8 percent being strongly opposed. Only the victorious are going, what will the defeated do there, king Michael of Romania, one of the last heads of state alive from World War II, was invited by Russian president Medvedev to attend the ceremony. German Chancellor Angela Merkel confirmed her attendance on 30 April, as did Acting President of Poland Bronisław Komorowski, chinese President Hu Jintao confirmed his attendance at the parade on 3 May. The following day Slovak President Ivan Gašparovičs attendance was confirmed, on 8 May Sarkozy and Berlusconi announced that they wouldnt be attending the parade in Moscow, so that they could tackle the European sovereign debt crisis. The State Anthem of the Russian Federation is the name of the official national anthem of Russia. Its musical composition and lyrics were adopted from the State Anthem of the Soviet Union, composed by Alexander Alexandrov, the Soviet anthem was used from 1944, replacing The Internationale with a more Sovietcentric and Russiacentric song. 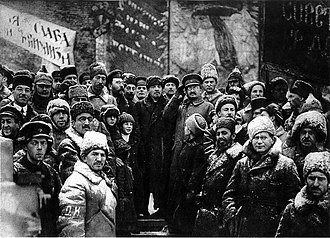 The anthem had no lyrics after 1956, due to the lyrics having references to former leader Joseph Stalin. New lyrics were introduced in 1977 by Mikhalkov with lyrics placing less emphasis on World War II, the Russian SFSR was the only republic of the USSR without its own anthem, although most republics within the federation did have anthems of their own. 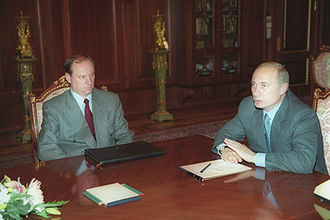 The government sponsored contests to create lyrics for the unpopular anthem, Glinkas anthem was replaced soon after Yeltsins successor as President of the Russian Federation, Vladimir Putin, first took office on 7 May 2000. 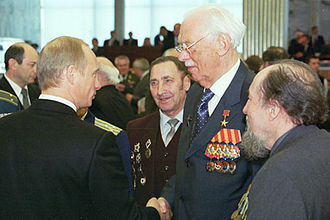 Yeltsin criticized Putin for supporting the reintroduction of the Soviet-era national anthem even though opinion polls showed that many Russians favored this decision, Public perception of the anthem is mixed among Russians. The anthem reminds some of the best days of Russia and past sacrifices, the Russian government maintains that the anthem is a symbol of the unity of the people, and that it respects the past. A2009 poll showed that 56% of respondents felt proud when hearing the anthem, before Molitva russkikh was chosen as the national anthem of Imperial Russia in 1816, various church hymns and military marches were used to honor the country and the Tsars. 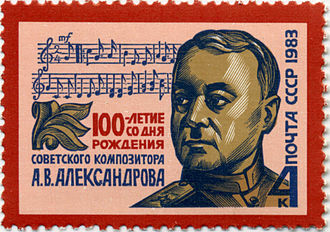 Songs used include Grom pobedy, razdavaysya. and Kol slaven, Molitva russkikh was adopted around 1816, and used lyrics by Vasily Zhukovsky set to the music of the British anthem, God Save the King. 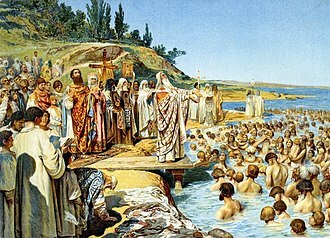 Russias anthem was influenced by the anthems of France and the Netherlands, in 1833, Zhukovsky was asked to set lyrics to a musical composition by Prince Alexei Lvov called The Russian Peoples Prayer. Known more commonly as God Save the Tsar and it was well received by Nicholas I, who chose the song to be the next anthem of Imperial Russia. The song resembled a hymn, and its style was similar to that of other anthems used by European monarchs. The Russian Airborne Troops or VDV is a military branch of the Armed Forces of the Russian Federation. They are a force, on par with the Strategic Rocket Forces. The force was split after the dissolution of the Soviet Union, losing divisions to Belarus and Ukraine, Russian airborne forces have traditionally worn a blue beret and blue-striped telnyashka and are called desant from the French Descente. The first airborne forces parachute jump is dated to 2 August 1930, Airborne landing detachments were established after the initial 1930 experimental jump, but creation of larger units had to wait until 1932–33. On 11 December 1932, a Revolutionary Military Council order established an airborne brigade from the detachment in the Leningrad Military District. V. Two further airborne brigades and three regiments were created in 1936. In March and April 1941, five Airborne Corps were established on the basis of the existing 201st, 204th, 211th, 212th, and 214th Airborne Brigades. The number of Airborne Corps rose from five to ten in late 1941, the Soviet airborne forces were mostly used as foot infantry during the war. Only a few small airborne drops were carried out in the first desperate days of Operation Barbarossa, in the vicinity of Kiev, Glantz writes, After the extensive airborne activity during the winter campaign of 1941–42, airborne forces underwent another major reorganization the following summer. Furthermore, the Stavka converted all ten airborne corps into guards rifle divisions to bolster Soviet forces in the south, nine of these divisions participated in the battles around Stalingrad, and one took part in the defense of the northern Caucasus region. The Stavka still foresaw the necessity of conducting actual airborne operations during the war, to have the Stavka created eight new airborne corps in the fall of 1942. Beginning in December 1942, these corps became ten guards airborne divisions, the new guards airborne divisions trained in airborne techniques, and all personnel jumped three to ten times during training, though many were from jump towers. After the defeat of German forces at Kursk, the bulk of the airborne divisions joined in the pursuit of German forces to the Dnepr River, even as ten guards airborne divisions fought at the front, new airborne brigades formed in the rear areas. Soviet Paratroopers deploy from a Tupolev TB-3 in 1930. An Ilyushin Il-76 "Candid" loading VDV personnel in 1984. Soviet-German War vintage Soviet Naval Infantry uniform. 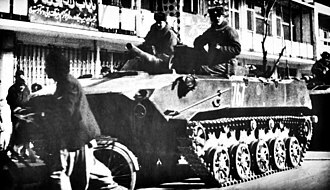 Soviet marines during a demonstration in 1990.